An upward-looking sonar device, mounted on the lake/river/ocean floor to accurately measure ice draft in shallow water environments. 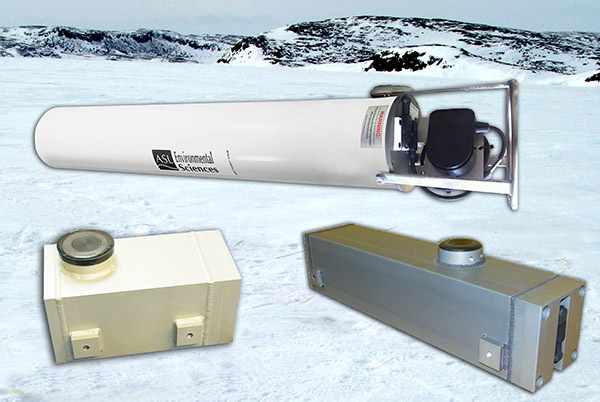 The Shallow Water Ice Profiler (SWIP) is a real-time acoustic ice thickness measurement (ice draft) instrument for shallow water applications. The underwater components include a low-cost acoustic transducer, a tilt sensor, a high-precision pressure sensor and a temperature sensor, all providing suitably high resolution for shallow water measurements. The instrument can be operated in an internal recording mode with a connection to an underwater battery pack for power, or with RS-422 serial output for real-time operation using an underwater cable which also allows for external power.